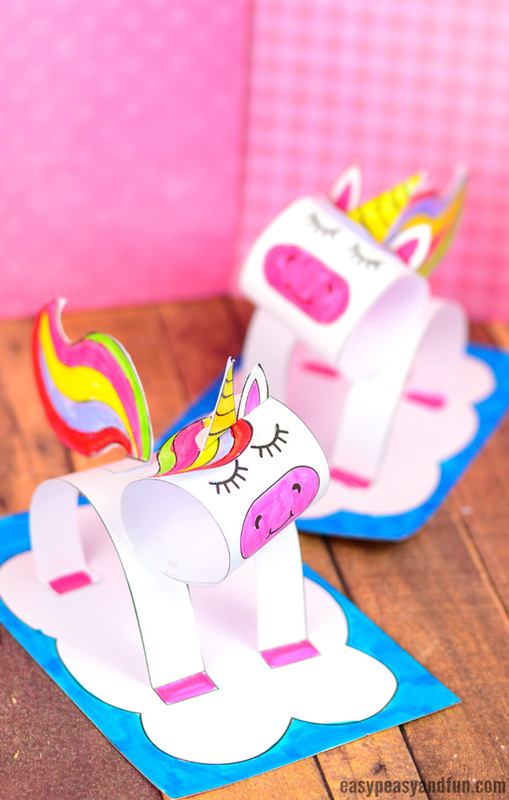 These 3D construction paper unicorns paper toys are here to spread some magic. 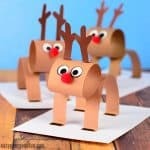 They are super quick and easy for kids and kids at heart to make and it will be hard to stop at just one. Everyone needs a little bit of magic in their life and what better way to bring it in, than with glitter and unicorns. 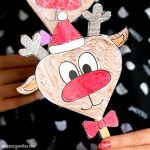 This glittery magical 3D Construction Paper Unicorn craft is a spin off of our 3D paper reindeer, only this time the template to make this craft is also included for easier crafting. Naturally this one can also be used to make a horse craft, just loose the horn and you have a fun looking stallion. Ready to make magic happen? Let’s start crafting. Best to print a few copies, as you’ll want to make more than just one! 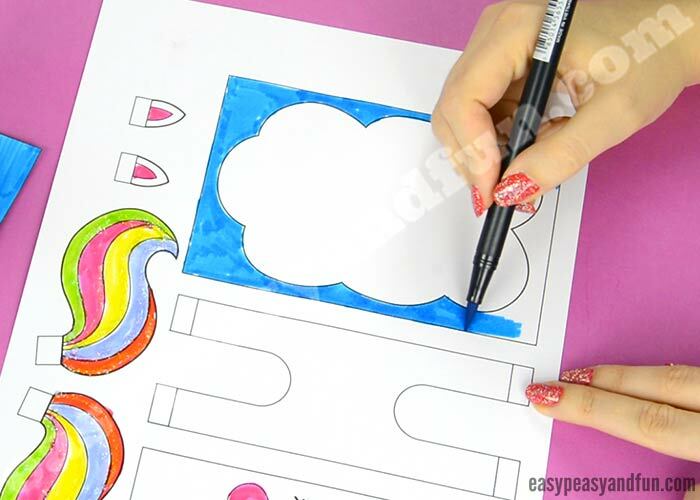 Print out our template (located at the end of the tutorial). 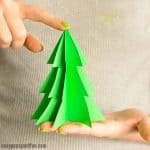 You can print it on regular paper but it’s best if printed on construction or heavier print paper. 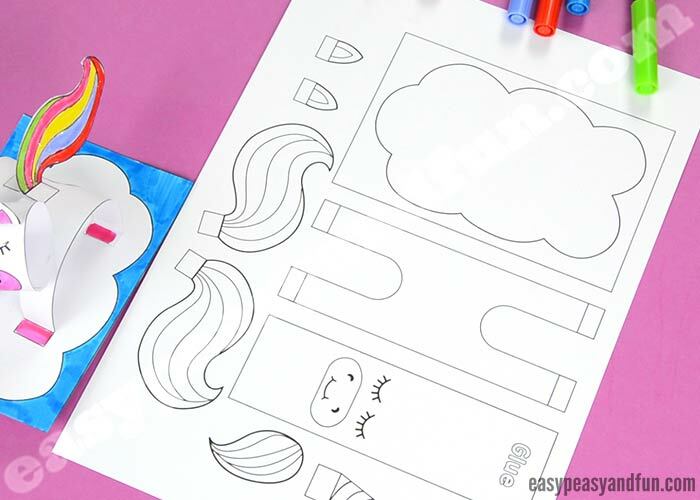 Color in the template (skip the hooves). Use all your favorite colors (this one is a rainbow unicorn). Add glittery accents with glitter glue if you wish your unicorn to look fancier, but you will have to wait for the glitter glue to dry before moving forward. Glitter sure does add magic to this fairy tale creature. 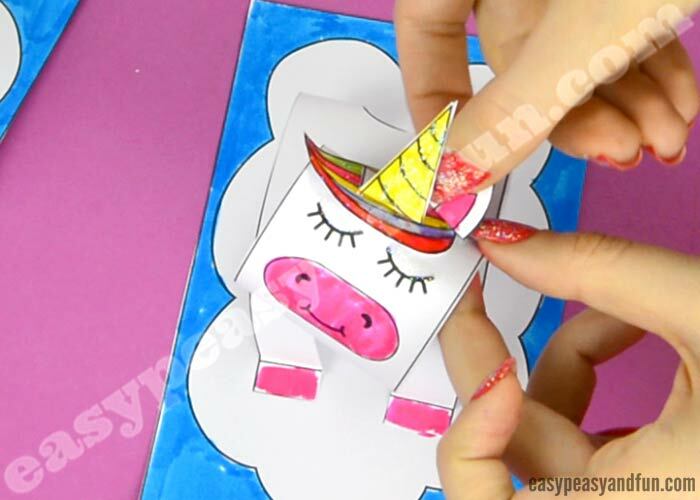 Cut out all the unicorn parts. 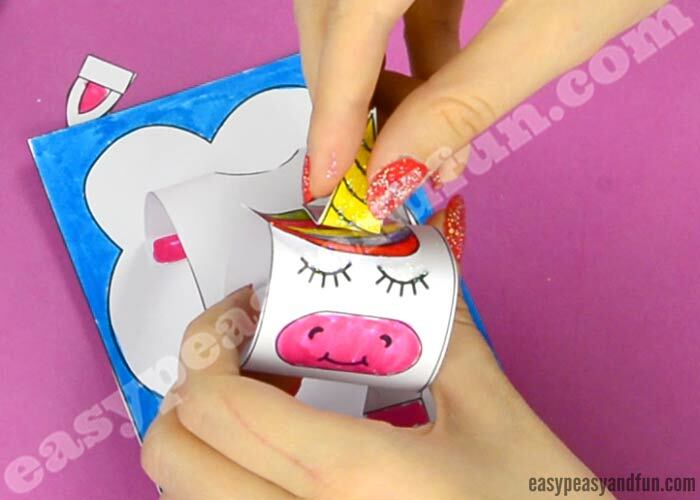 Take the body part and fold the hooves. And stick the unicorn body on the cloud base. 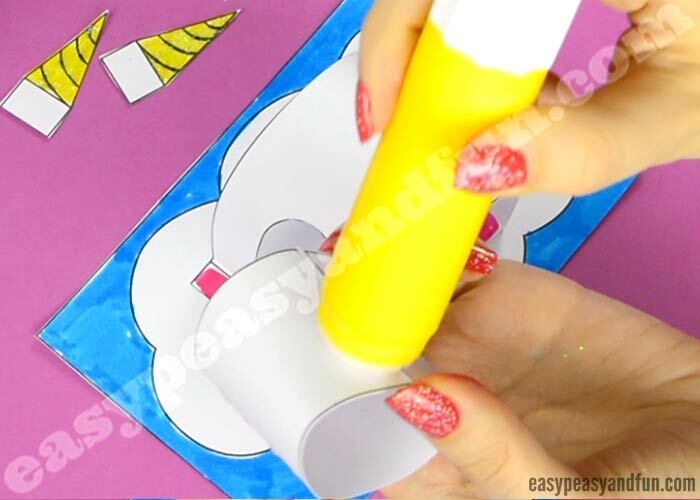 Take the paper strip with the unicorn head and apply glue on the area marked with the word glue. 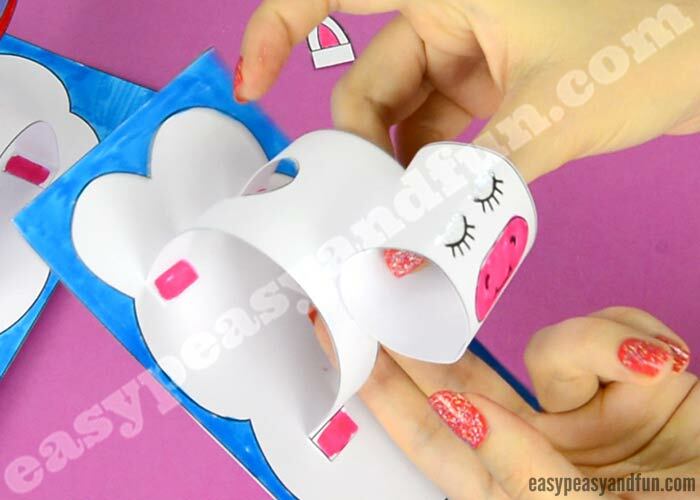 Glue together in a roll. …and stick the head on the body. Take the colourful mane and glue it on the head. Next comes the horn. Fold bottom part (along the line) on both horns. 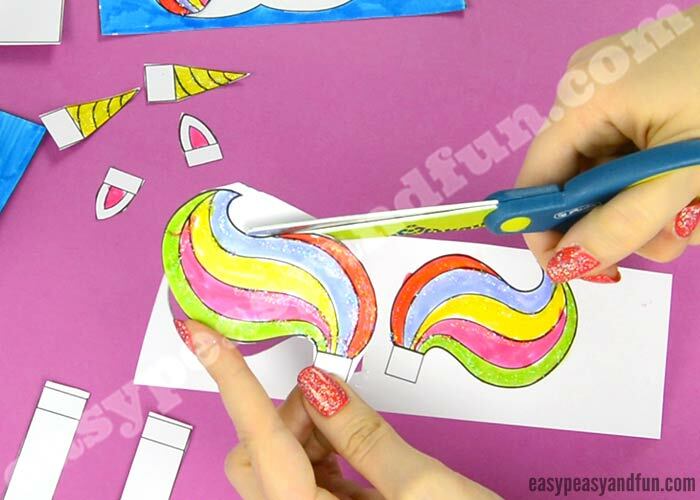 Glue the two horns (top parts) together, so it’s colored on both sides. 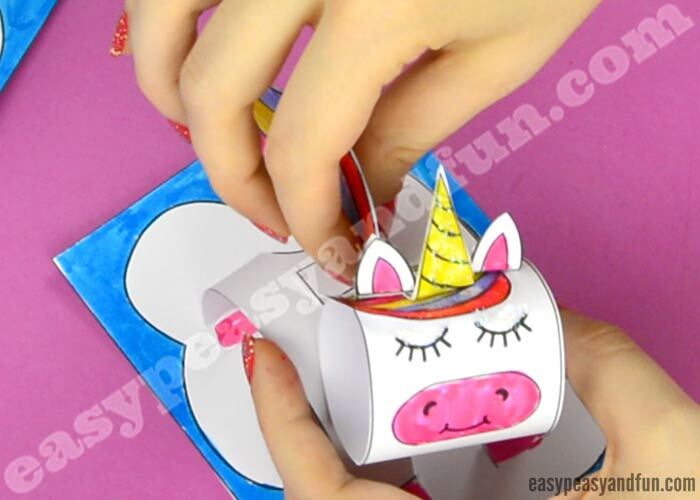 Apply glue on the bottom part and stick it on the unicorn head. Fold the ears and stick them on the head. Fold the tale (along the line), apply glue on the back of the tail and glue two tail halves together. Stick the tail on the body of the unicorn. You just made some magic! 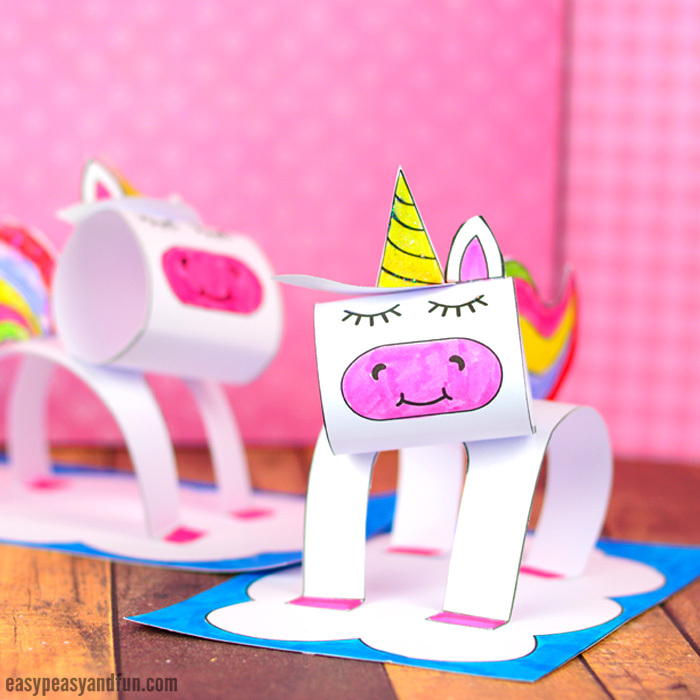 Your 3D Construction Paper Unicorn is all done and waiting for it’s colorful friends to join him or her. 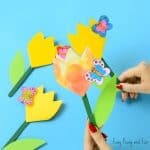 Thanks for the easy and inexpensive crafts. My afterschool group is Junior kindergarten to grade 5. 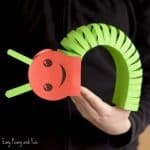 They all really enjoyed this craft! thank you for sharing!! 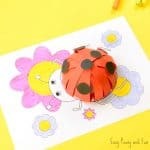 My kiddos loved this on a rainy afternoon! !